Don't ReUse a Priority Mail Box to Mail Anything! The USPS has warned a good citizen that he is breaking federal law by re-using a USPS Priority Mail cardboard box in this Denver story. This is stupid. I once had my mail held at the local post office during a vacation. When I returned, the postmaster handed me my mail in a small cardboard container. I left the cardboard container in the garage, and my cat used it for a bed. When she curled up, she fit perfectly in it. Was that misuse of federal property? I’ve also reused stamps if they weren’t canceled. I’m in big trouble now. Don’t ReUse a Priority Mail Box to Mail Anything! Cool People Care emailed about this opportunity to help Team Green, Bridgestone Americas and others clean up Percy Priest Lake. As a 30-something, I would boat with a former boyfriend in the 1980s. We drank beer and sunk the cans or bottles in the lake. I was a bad person back then. I would never do that now. I feel as if I should help out Saturday, but I’m involved with my own Great American Clean Up project along Newsom Station Road. I’m atoning by cleaning up someone else’s litter, while someone else cleans up my litter from long ago. All of us probably removed our socks when we went wading in the creek as a child. I know I did. But I put them back on after leaving the water, although my feet were usually still wet. In my neighborhood down by our creek, a child (or at least I hope it was a child) left the socks on the rocks to dry. And forgot them there. I didn’t pick up the socks to check out the condition, if they were wearable by me or good enough to save. 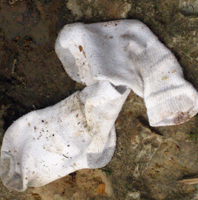 I hope that Mom or Dad sent the litterer back out to find the socks. 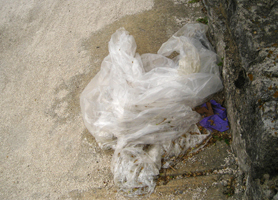 A few weeks ago, there were several pieces of large heavy plastic tarps scattered around the West End Avenue area. I photographed this one on a very windy day. It never moved. I guess that they are part of the construction trash generated by the large number of condominiums being built in the area. I saw another large piece of plastic today. It is not trash generated by the Country Music Half Marathon and Marathon. Metro has done a great job of cleaning up the large amount of trash generated by that event. Why put the trash in a bag if you’re just going to throw it on the side of the road? Or did it fall off a pick up truck? I never understand this.